Mellody Hobson is the president of Ariel Investments (AI), which was founded in 1983 by John W. Rogers, Jr. With the continued growth of the African American middle class, the number of black investors has risen. Ariel Investments is one of the nation’s few African American-owned investment companies that focuses primarily on the needs of those investors. Ariel’s current assets sit at $10.1 billion. Hobson views stocks as the best channel to growing significant wealth for African Americans. Combining her knowledge of investments with her drive for bettering the black community, Hobson has been able to use her platform at Ariel to convey and promote these ideas. Because of her success at Ariel, Hobson is a regular guest contributor of financial advice at CBS News and The Tom Joyner Morning Show where she speaks on investor education, financial literacy, and the current economic trends affecting the general public. In addition, she also writes a financial advice column for Black Enterprise magazine. In 2009 Hobson produced and hosted a show on ABC Network called Un-Broke: What You Need to Know About Money. Hobson also serves as the director of the Estée Lauder Companies, Inc.; the Starbucks Corporation; and as chair of the board for DreamWorks Animation SKG, Inc., the film production company of her husband, George Lucas. In 2015 Hobson was selected for inclusion on Time magazine’s annual list of the one hundred most influential people in the world. In 1991 Hobson earned an A.B. degree from Princeton University’s Woodrow Wilson School of Public and International Affairs. Over the course of her career, she has received honorary doctorate degrees from Howard University, St. Mary’s College, and the University of Southern California. While studying at Princeton, Hobson took a summer internship at Ariel Investments, run by a fellow Princeton graduate and Ariel founder, John W. Rogers, Jr. In an interview for Black Collegian Online, a database providing African American and other students of color, Hobson reflected on her internship experience, saying it “convinced me that was where my future would be.” After graduating in 1991, Hobson began her ten-year climb to presidency which culminated in her appointment to the post in May 2000. In a chapter she wrote for Sheryl Sandberg’s 2014 professional growth book for women, Lean In for Graduates, Hobson described what it is like to be not only a woman in the business world, but an even rarer person, an African American woman in the business world. Hobson credits her success in the investment industry to her upbringing. She said growing up in home mired in poverty, she found interest in understanding the power of money. 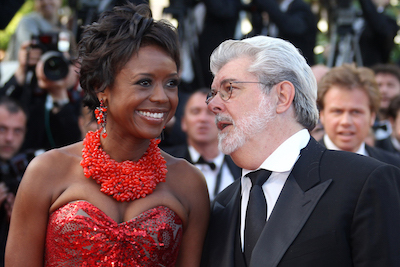 On June 22, 2013, Hobson married George Lucas, the Hollywood filmmaker and entrepreneur best known for creating the Star Wars movie franchise which began with its first film in 1977. Hobson is the stepmother to Lucas’s three children from his first marriage. Hobson and Lucas have one child together, a daughter named Everest Hobson Lucas. “Our Team” Ariel Investments, LLC, website, https://www.arielinvestments.com/our-team/; Jeanne Lesinski, “Hobson, Mellody, l969–,” Contemporary Black Biography, 2004 in Encyclopedia.com. http://www.encyclopedia.com/doc/1G2-2874200042.html; Beth Kowitt, “Why Mellody Hobson Stopped Apologizing for Being a Black Woman,” Fortune, December 3, 2014, http://fortune.com/2014/12/03/mellody-hobson-next-gen/.